I love when the bride or groom does something uniquely fun in the morning with their best friends. Erin spent the morning hiking and she let me come along. So cool and such a great representation of who she is outside of this one day. This wedding was beautiful, from the awesome details (the dance floor had a leaf ceiling), to every bridesmaid wearing white (except the MOH) to a mountain backdrop at the wedding to the killer band it was just awesome. Erin and Eric were such a cool couple and we enjoyed capturing their wedding day. As we talked to friends and family of Sarah and Kyle it was clear that they were an incredible match because they each helped to transform the other into a better version of themselves. That's a beautiful way to start a marriage. We got to spend the day before filming their rehearsal dinner. I love filming rehearsal dinners. There's a different feel to the day as it's a little more relaxed and some really great stories come up that you probably wouldn't otherwise hear. It really helps to round out the entire wedding story. Alerin Barn is an incredible location to get married. Sarah and Kyle's wedding was perfect. Not only because there was beautiful nature all around, but because everyone there had so much obvious love for the two of them. This is a family business. Truly, we love it. The cinematography team (Lori and Daniel) is a married couple. Well that married couple is having a baby! We really wanted to surprise our family, so we invited our family to a cabin in Vermont over the Christmas break. My (Daniel) family is still in Texas so they flew up for the holiday and Lori's family is in New England. We surprised them on Christmas Eve. We gave our families mugs that say, "The best moms get promoted into grandmothers." I'll let you figure out what the mugs for any who wasn't a mom. You can see our parents reaction at the end of the video. We spent one day of the trip making the video below with our family. We brainstormed it over an hour or so and then wrote it over night. Laura's (my sister and the amazing photographer of Latimer Studios) boyfriend Gabe did the amazing voice over. It was so much fun and we are so excited! Enjoy. Yeah, I can hike that! We always love a good challenge and we were met with a great one at this beautiful wedding in the mountains. Olivia and David have a huge heart for their families. One of their grandfathers built a chapel in the woods on the Von Trapp Family Lodge property. So of course this spot was the perfect spot to start their wedding day. It’s where they first saw each other and where they did commnunion. The Von Trapp Family Lodge is beautiful. It's is a perfect backdrop to tie the knot. One of my favorite parts of this wedding is the way they wrote their vows. I won't ruin it, but it's a unique idea I hadn't seen before. Von Trapp Family Lodge Wedding // Vermont Destination Wedding // Olivia + David Wedding Highlights from Latimer Studios on Vimeo. I love when we get to see the unexpected and something new. This was the first time that we have filmed one couple having two completely different weddings in one weekend. I am incredably impressed by how Sharada and Billy made the entire weekend seem so seamless and each wedding unique. It was so fun to be at this wedding! If you’re reading this and you didn’t go to this wedding, please find a time machine, become friends with Sharada and Billy, secure an invite and go! This weekend was full of so many great moments that we decided instead of one highlight film we were going to make two. This one covers the American Wedding Day. They picked the Hyatt Regency in Cambridge for a couple reasons, but one of them was because they have such a variety of rooms that each wedding day could feel completely different and make each wedding completely unique. I loved so much about this wedding and there are two things that really stood out about the American Day. First, is that they took dance lessons and choreographed their first dance. 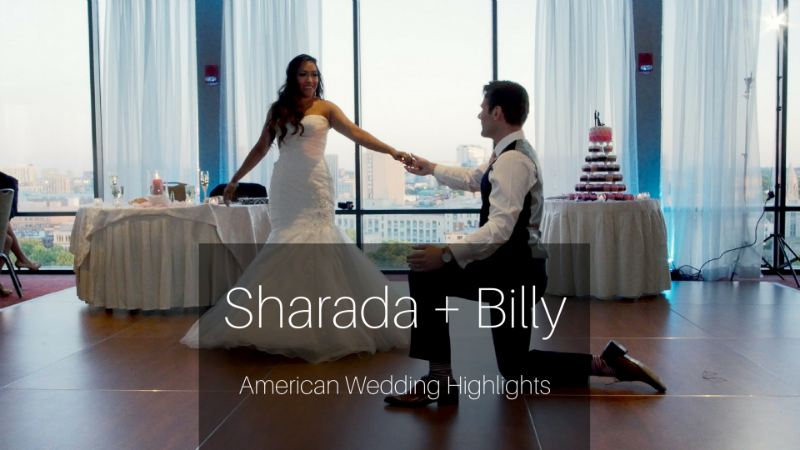 Sharada has a history of teaching dancing, but Billy definitely stepped up to the challenge. They did so well. Secondly, Billy planned the entire honeymoon and surprised Sharada. He didn’t tell a soul where he was going and if you watch you can see the moment she finds out. Spoiler: It’s amazing! The picture below is also a spoiler. Sharada + Billy \\ Day 1 of 2 \\ Hyatt Regency Wedding \\ Cambridge, Mass \\ Indian Wedding \\ from Latimer Studios on Vimeo. Bonus: Billy playing golf before his wedding.